We recently stayed at our friends Robert & Carly’s home in Calistoga during a visit to the Valley. Their hospitality is terrific and it is so kind of them to let us stay. Since they both worked on Saturday, we thought it would only be fair to pick up dinner. Before Bill and I headed to the market, I took a look in their herb garden and I thought they had some really healthy Thyme! 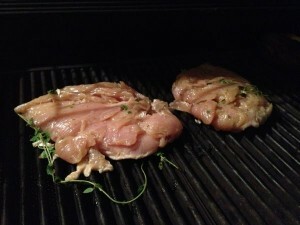 I found some nice chicken breasts at the store and decided that brining them would be the method to prepare them. Bill helped by cutting some herbs for me. At the time, I didn’t really think that the “thyme” had the typical lemon scent, but since smelled fresh and delicious I added it to the brine just the same. Later, Carly corrected me and we had a good laugh when she explained that the “healthy thyme” herb I was using was really fresh Marjoram! I haven’t grown this at home and have since learned that it is a somewhat cold-sensitive perennial herb or undershrub with sweet pine and citrus flavors. It is used extensively in Mediterranean cuisine, is most commonly used to season fish, poultry, and strong-tasting meats such as lamb and duck. Additionally, marjoram leaf may be used to season sauces for pizza, pasta and other dishes. 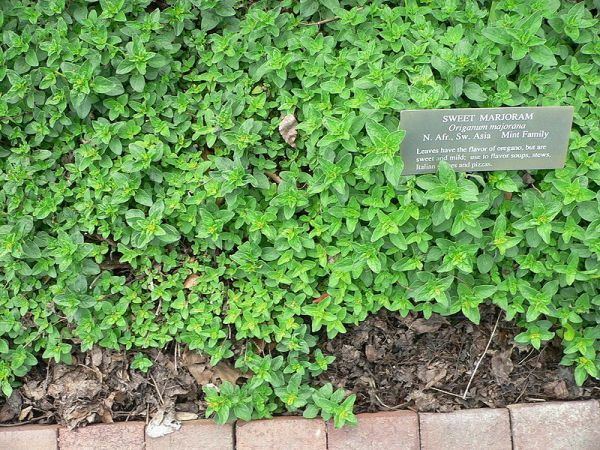 I’ve learned that there are a couple of other herbs that could be used as acceptable substitutes for marjoram if you don’t have any on hand; Oregano is ideal, because it is very similar in taste and texture but slightly stronger. You would use roughly half of the amount of oregano than you would if you didn’t have marjoram. 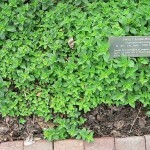 Thyme is another option as it is very similar in taste and appearance. Although its taste is not as light as the flavor of marjoram, thyme can give food a delicious, earthy flair. Who knew I could use Marjoram instead of Thyme? 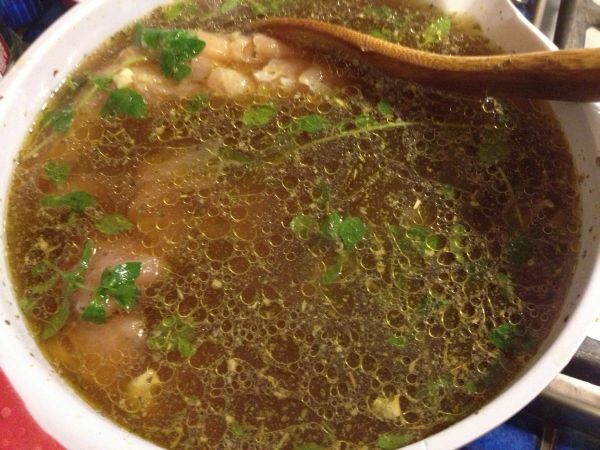 It looks very similar and it worked and this chicken dish. It was wonderful! A great way to prepare chicken breasts so they wont dry out is to brine them! 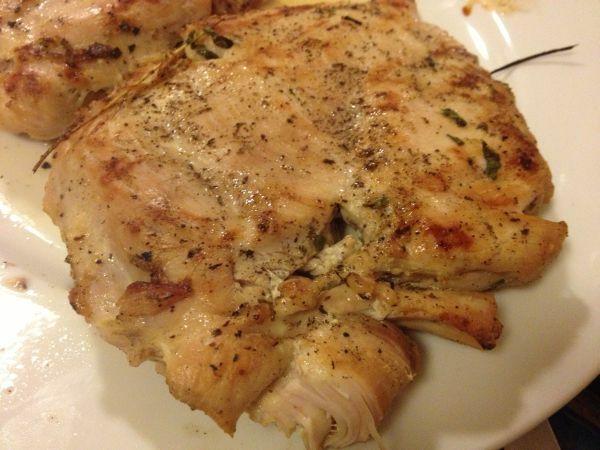 We eat a lot of chicken, but when the breasts no longer has its protective skin, it often ends up dry. Don’t fret it, there are a few things you can do to keep this from happening. Pound the chicken breasts to an even thickness (to about a half of an inch thickness, which will give the breast a uniform thickness and break up the meat, allowing the brine to permeate the meat quickly) and then brine it for at least an hour before grilling it. Direct heat helps prevent over drying, while rendering a moist and delicious result! Combine all the ingredients listed above for the brine and mix until dissolved. 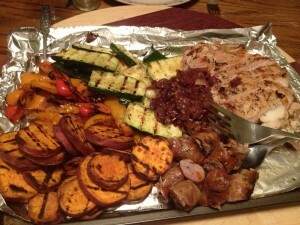 You can use a shallow, covered baking dish or a large zip lock bag for marinading. Be sure to brine for at least 30 minutes as it is important to give the brine enough time to work. Have your grill completely heated when the brining is done. 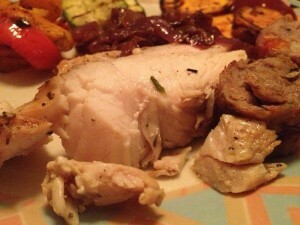 You will want to take the chicken directly from the brine to the grill. With the grill hot, put the chicken over the hottest part of the fire. Turn the chicken only once and leave the lid off the grill. Be careful not to over cook, and you will end up with the perfect pieces of chicken. Many experts recommend that chicken breast meat must be cooked to an internal temperature of 170 degrees, but others say 160 degrees is fine. The chicken will remain moist if you cook to 160. We grilled additional fresh vegetables including peppers, zucchini and par-cooked sweet potato slices! A couple flavorful sausages and caramelized onions made it a completely delicious meal! 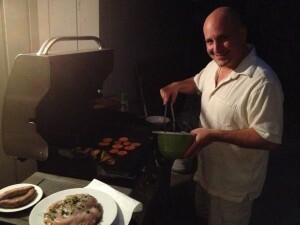 Robert did a splendid job of manning the grill! Our chicken was super moist and delicious! We had enough left over for a second meal and because it was so moist, we were able to use it for a flavorful homemade pizzas the next night! There were a lot of laughs, along with a lot of wine shared those couple of days!